Young Makers is a sub-group of the Hackspace, aimed at encouraging younger people (up to age 18) into the world of tech and making. In 2015 and 2016 we ran a series of workshops for young people, on topics from robotics to programming a python game. Based on feedback from this and in partnership with social enterprise Step Into Tech, in 2017 we launched an informal meetup for techy kids and their parents - Young Makers Tech Club. The club is a collection of people ranging from age 8-18, who code, make and create with electronics, socialise together and have fun. We meet every other Saturday, on the first floor of the Millenium Library in Norwich City Centre. The club is really informal, and we welcome everyone to come along and have fun with tech. Parents are welcome to come along, have a coffee and chat about their kids' techy minds! 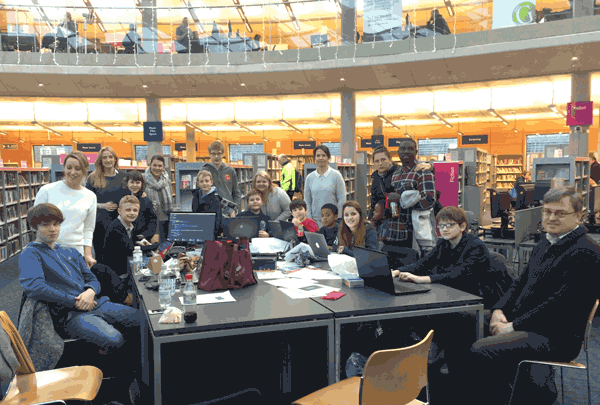 We meet every other Saturday on the second floor of the Millennium Library at the Forum, Norwich. To find out more, contact claire@stepintotech.org or follow @step_into_tech on twitter. Parents should stay with their children if they are under 12. Venue for meeting can occasionally change due to trips to techie organisations. Please check twitter or email Claire to make sure of the venue before setting off to the session. Our first and most successful project to date was part of an exhibition at Norwich Castle, a collaboration with DoESLiverpool, a co-working space in the heart of Liverpool and funded by the Crafts Council, Norwich Castle and Liverpool FACT. 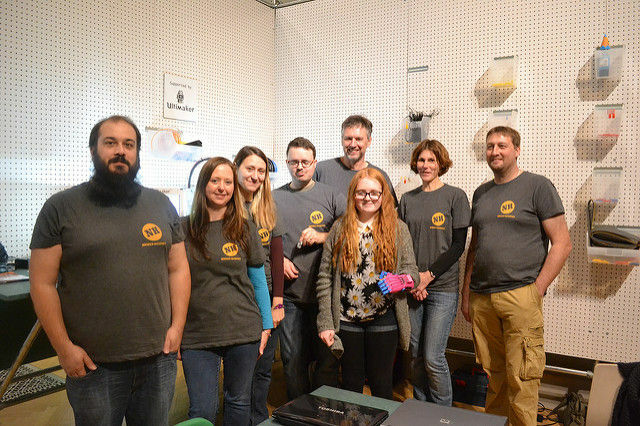 Inspired by a local family who used DoESLiverpool's workshop to print hand parts from the open-source Raptor Hand design, they asked other similar organisations to join them in running measuring workshops and print run in other parts of the country. This was all allied to the global project Enabling the Future which links volunteer 3D printers with young people that are lacking fingers. Printing a Raptor Reloaded costs around £10 and a lot of patience but is a lot more effective for young people than waiting for a major prosthetic which they have grown out of before it is made, and too expensive generally. We printed hands for four young women aged 3 to 15. Pictured here is Erin with her hand.